Pushing the boundaries of conventional working environments. Our client wanted to make the creative activity and interaction that takes place in the office buildings more visible. The Lake is the heart of the Park, so it was a natural proposal to locate this activity on the Lake. From that starting point, the ideas of lightness, visibility and views all developed the design of the Floating Pavilion. A combination of imaginative architecture, specialist engineering and boat-building technologies were employed to create the pavilion. Four columns support an over-sailing anodized aluminum roof, creating a sense of enclosure and shelter while allowing 360-degree views across the lake through floor-to-ceiling glazing, reflecting water and light to create a unique, beautiful and inspirational meeting place. 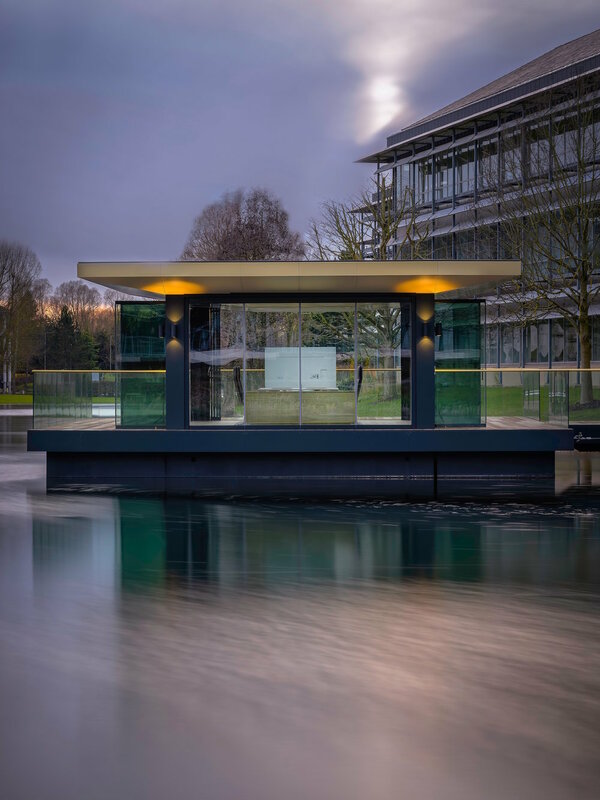 Accessed via a bridge over the Lake, the glass Pavilion can be booked exclusively by the Park tenants. 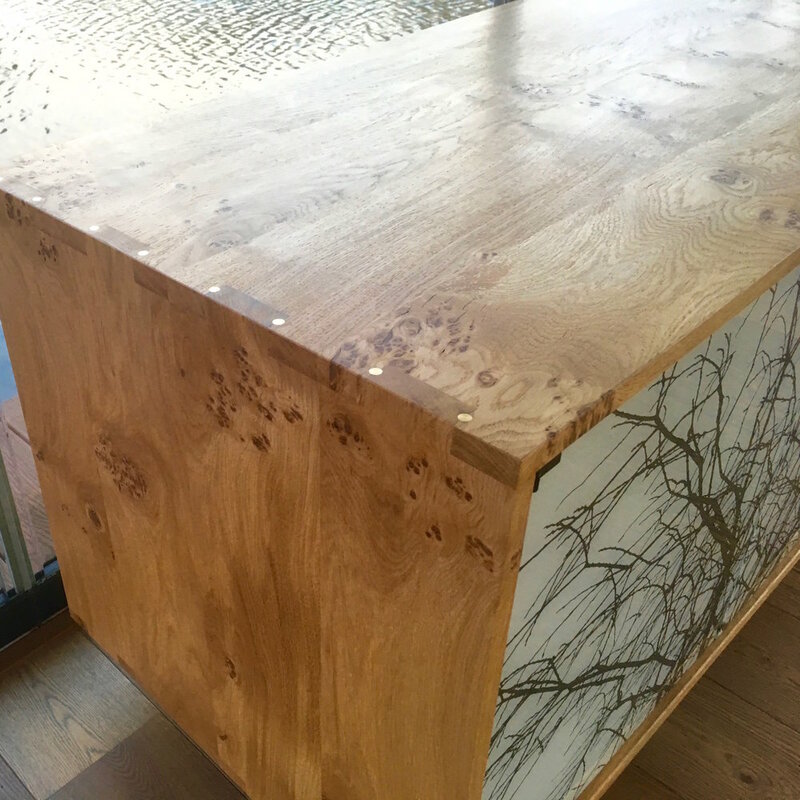 The media centre is a handmade credenza designed using traditional air dried oak from Castle Howard in Yorkshire and bespoke glass doors by West Country Artist Antonia MacGregor. 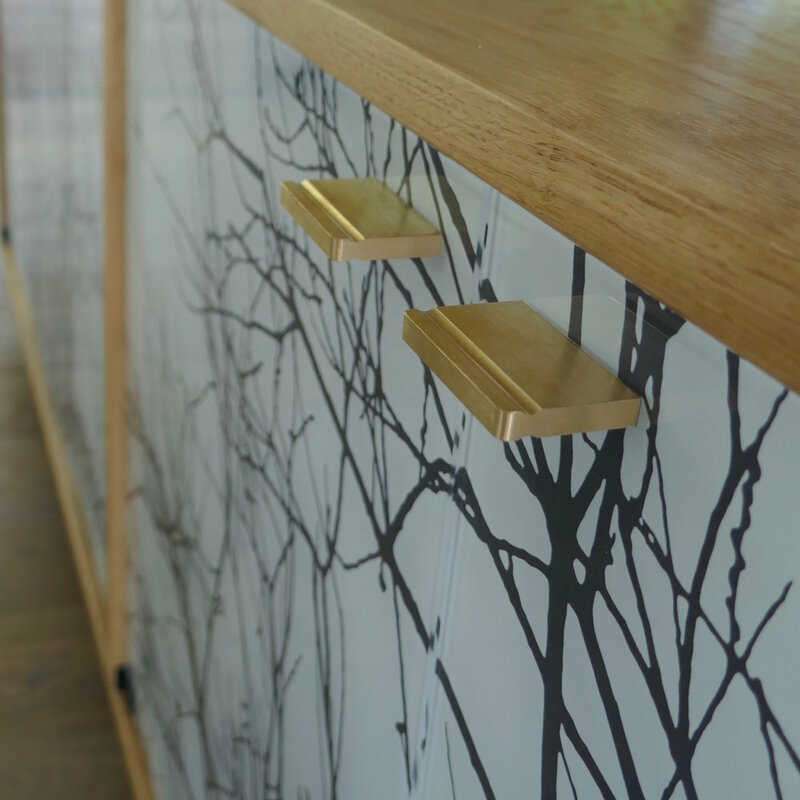 Handcrafted into a stunning piece by London Furniture Maker Max Payne. It’s fitted to give the Pavilion full conference facilities. The hull and superstructure components were fabricated off-site then transported to site by road, before being craned onto the Lake and finally assembled on the water. The coordination of these elements was a significant technical challenge. In addition, the stability of the pavilion relates to torsional movement and the base has to be stiff enough to avoid the upper parts flexing unduly. There is also the need for stability of location and a simple anchor restraint on this man-made and lined lake was not an option. Instead, it had to be horizontally restrained from the water’s edge. This allows the pavilion to rise and fall with the water levels, the lake serves as a rainwater collection basin and can rise 1.5 metres in a few hours. The Floating Pavilion is a unique, multi-functional and flexible space that offers an inventive space for creative collaboration, corporate meetings and tenant social events.